Welcome to my Naiant littlekit microphone pre-amp project page. I originally posted about this project on this thread at the Tapers Section Forums. 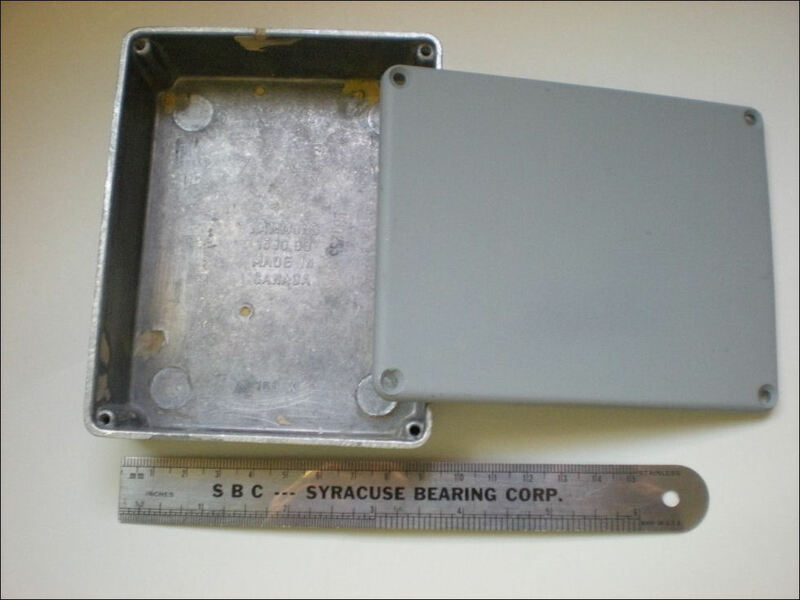 I have since re-designed it (details here) to run on a rechargeable Li-Ion battery that is located inside the aluminum case and is rechargeable from the outside. When Naiant microphone and pre-amp designer Jon O'Neil sold some of his microphone pre-amp circuit boards in the TapersSection Forums Yard Sale in June 2009, I bought one. The circuit board I purchased didn't have a working 48v phantom power voltage converter on it. That was completely fine with me because I wanted to build a 48v DC phantom power microphone pre-amp which would be powered by five 9v batteries. It was good luck that Jon's circuit board plus power switch and the (5) 9v batteries fit nicely in a Hammond 1590BB enclosure I already had (below, right). After hearing some recordings made using the M148 microphone pre-amp designed and built by pioneering taper Doug Oade, I was intrigued by the possibility of using batteries alone to provide clean phantom power to condenser microphones in the field the way his pre-amp did. 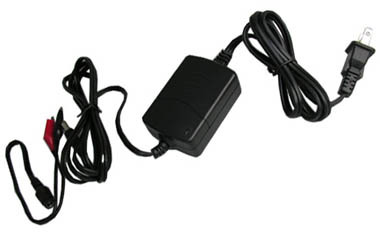 The M148 is nicknamed "the brick" by users partially due to the weight, as it is loaded with several small but heavy sealed lead acid batteries wired together to deliver 48v DC to the microphones. 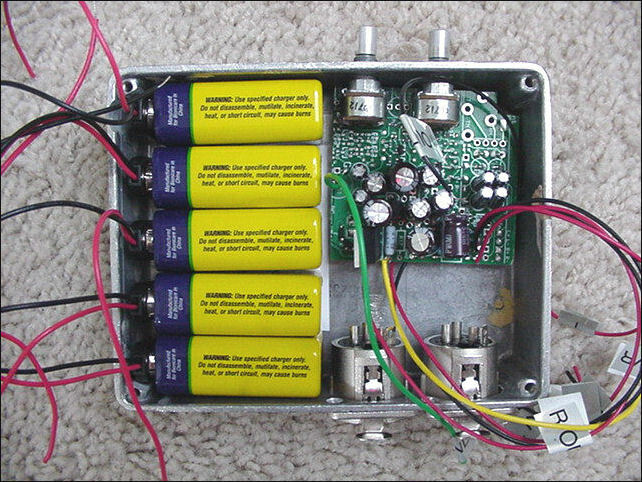 Those batteries are also used to power the transistor front end of the pre-amp. The partial littlebox circuit board I bought from Jon (left) was already stuffed with components. All I had to do was install a SPST power switch, a power indicator LED, and drill holes in the enclosure for the input & output jacks and the two gain knobs. I found some nice 9v battery connectors at Radio Shack. In the end, all the pieces fit together rather well in the small Hammond 1590BB aluminum enclosure (top left & above right). This schematic shows the microphone pre-amp circuit Jon designed and built. My pre-amp uses the INA111 instrumentation amp rather than the AD620 he used in the early littlebox pre-amps. It was my choice to go with the INA111. I am more familiar with that chip because I know what it sounds like in other IC based microphone pre-amps I've used. With five 9v batteries installed, my finished littlekit pre-amp (left) supplies approximately 45 - 52 volts DC of clean phantom power to the microphones. The gain range is 5db to 40db. The pre-amp is quite small, slightly heavy, and very clean sounding. It is powered with rechargeable 9v (7.2v nominal) NiMH batteries when recording with my AKG C-480 microphones. The AKG microphones perform well with slightly less than the full 48v DC phantom power those batteries supply. I got the name littlekit from Jon O'Neil as he was calling his pre-amp the Naiant littlebox and mine wasn't exactly a littlebox, but more like a DIY kit. 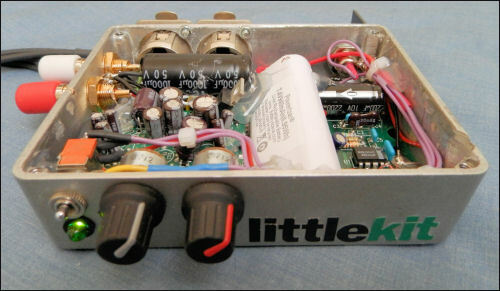 The fully assembled Naiant littlekit microphone pre-amp is pictured below, right. You can read the more detailed thread and view more photos I posted about the whole project here in June 2009 at the TapersSection Forums. For more information about the Oade M148 pre-amp that inspired my project, there is an excellent discussion about it with internal and external pictures here. The Oade pre-amp uses discrete transistors and transformers to supply very low added noise gain. 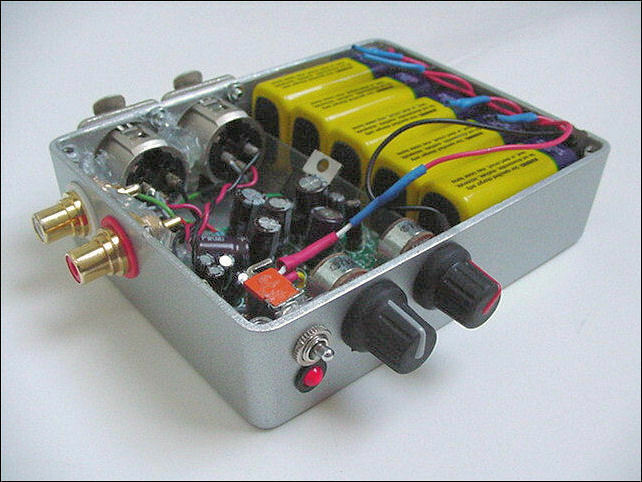 Maybe someday I'll have the money and time to build a transformer based microphone pre-amp like that. Until then, I'm quite happy using my littlekit. Due to the inconvenience of having to open the box up and pull out and recharge the (5) NiMH batteries individually every time I want to use it I haven't been using my littlekit pre-amp very much. 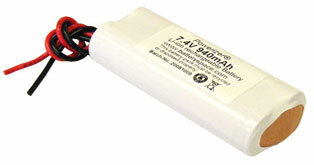 So, I decided to re-engineer it to run on a 7.4v rechargeable battery rather than 48v. I found a stand alone nominal 6v DC to 48v DC phantom power circuit board in a non-working Graham-Patten DMIC-20 I had in my basement. I did some tests and found it is a nice clean circuit that will supply plenty of current to run the littlekit pre-amp. The best thing about using the new circuit is that I can power it with a relatively inexpensive 7.4v, 940mAh single rechargeable Li-Ion battery pack (right) that will fit in the box with the new circuit after all the 9v NiMh batteries are removed! I had to add a power jack on the box, (top left photo) so I could charge the new battery pack from the outside with a dedicated Li-Ion battery charger (left). Since I had to take the littlekit apart to drill the hole for the new power jack and make the component changes, I also repainted the box a nicer, warmer metal flake silver color. I changed the red power on LED to green and tidied up the wiring a bit too. I'm, calling it Naiant littlekit v2.0. A picture of the re-engineered Naiant littlekit v2.0 working (below) embellished with some vinyl stick-on lettering I found at Hobby Lobby. I hope to test the pre-amp in the field soon. I tested out the re-engineered littlekit at the Molly Harris benefit concert at Stargazer's using my Audix Micro-omni's. It works and sounds great. Since I hadn't received the new Li-Ion battery yet, I was able to test run the littlekit using one used 9v alkaline battery which fit in the closed box. It worked great for all three bands! Surprisingly, there is still plenty of life left in that used battery too. This is what it looks like inside with the Li-Ion battery installed. I used hot glue to secure the battery inside the box.